My art career began as a child. 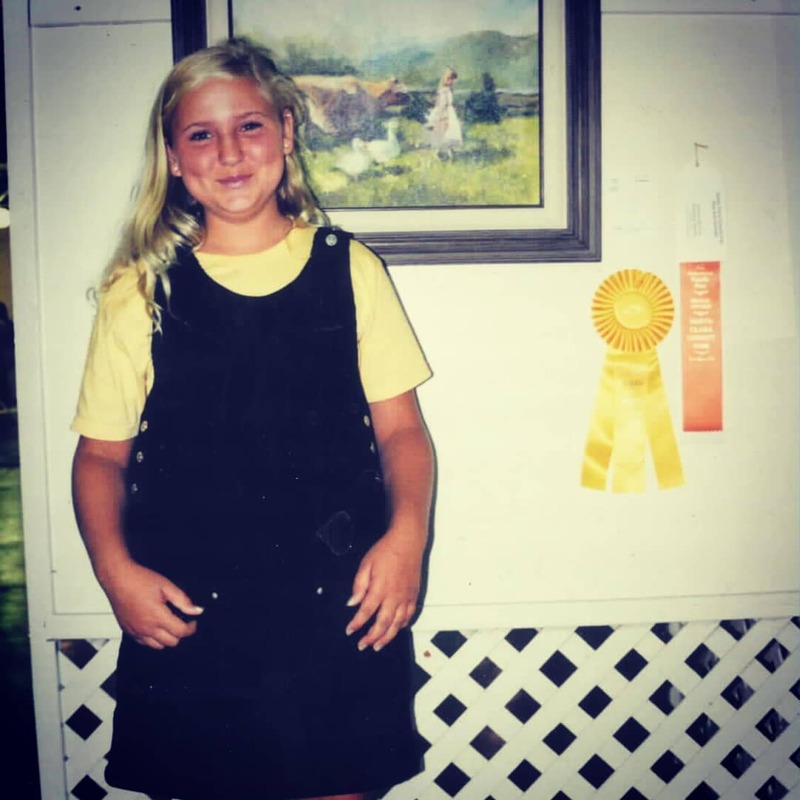 I won Best of Show ribbons in the County Fair for oil paintings and had my first commissions at eight years old. In high school, I entered beauty pageants for scholarship money and world peace. I pursued my talent at UCRiverside and spent five years in construction and property management, with a Certificate of Construction Industry Tech from Clemson University. I understand now that my obligation as an artist is to create peace at the ground level. Art that does good is my life’s work. I am the change I’d like to see. As a lifelong artist, I have two areas of focus – color that evokes and use of space. Public Art has been a natural direction for my career, spurning from a desire to rejuvenate blighted public spaces. I consider the audience when I design and even collaborate broadly throughout Communities to understand what holds value to the audience. What the Public responds to most within my work is my use of color designed to shift your attention like the swipe of an ipad and the meaning to each mural. Public Art can creatively make a place new again with a little paint. Public Art excites me because it ought to engage and capture. My projects are designed to be interactive whenever possible. It is how the younger generation engages with Art. Whenever possible, Public Art should be taking advantage of technology, especially social media, and finding business partners that require good public relations. I’ve painted murals full-time for 8 years. 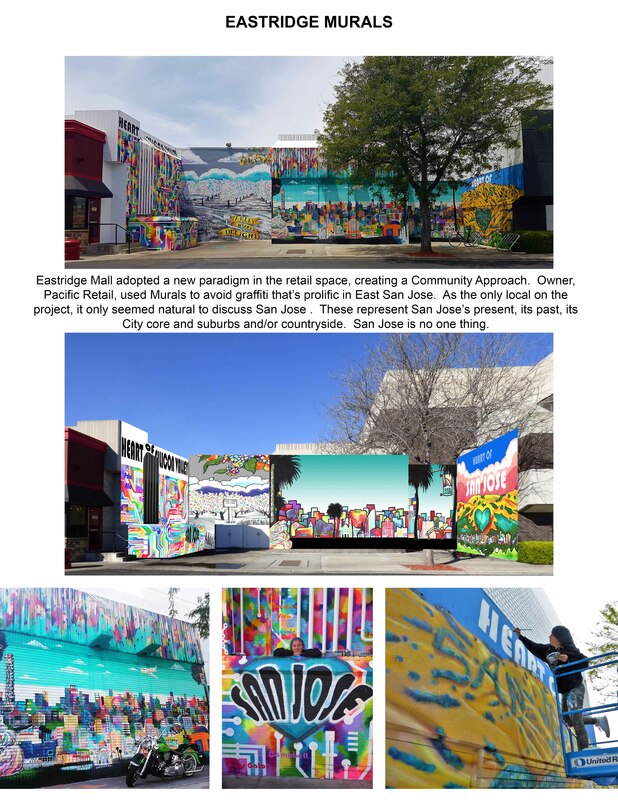 I began painting murals to public schools that face graffiti in rough San Jose neighborhoods. I saw what a little art does for a public space. The Falafel’s Drive In, a long standing, trendy San Jose eatery, was my first commercial opportunity because it was getting hit by pervasive tagging. I realized the responsibility artists have in easing Community tensions when possible. Color and “Sense of Place” is where Community member and property owners alike can agree. 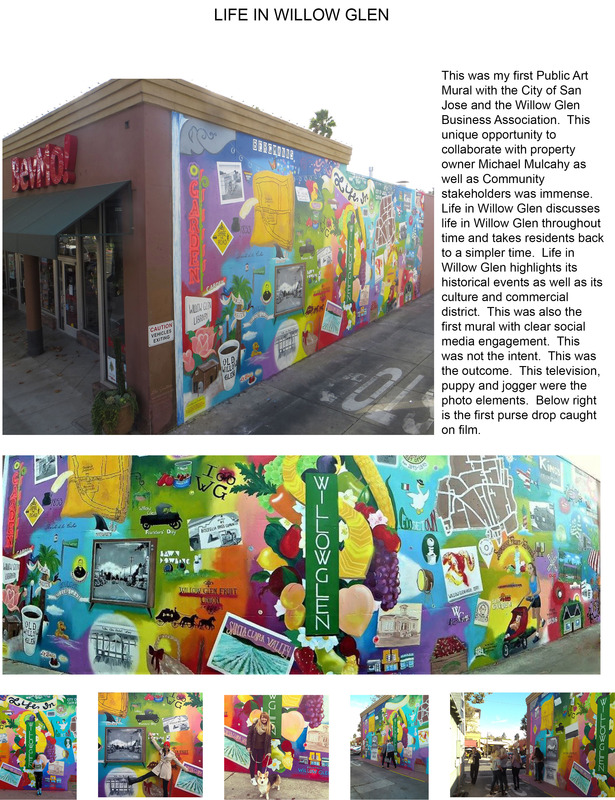 I see Public Art murals as the cost-effective art installation which also can do more than beautify. They can educate. They can provoke thought. Murals can, in this case, provoke play. 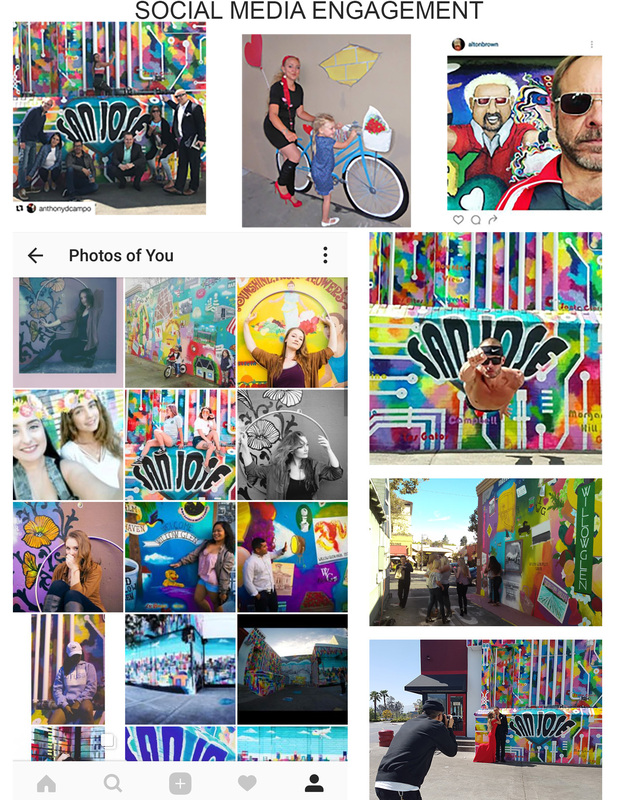 With Eastridge Mall, I turned a loitering and graffiti hotspot into a hall of color to engage with through social media. Subsequent to my painting, there’s been a stage, photo competition, music videos, and even a pop-up park all happening around these murals. The engagement through color has been spectacular. Likewise, through use of color, my fans know my work even though the style changes based on the needs of the client. Children pause in their tracks to tell me about a mural at their school with which they have a relationship. When asked, I find out that it’s a school I’ve painted. Whether it’s because I’ve developed my talent since I was a Lisa Frank loving kid or because I’m a rebel about it, the exciting color is my brand. Interior, Exterior, Ground and Floor Murals up to 5000 sq. ft.